The memorial stands in the parish churchyard. It takes the form of a rough hewn granite block standing 7 feet 6 inches tall with British and French flags in relief on the front face. The memorial covers World War 1 and World War 2 & Iraq and has recently had two names added. This contains 39 names for World War 1 and 21 names for World War 2. 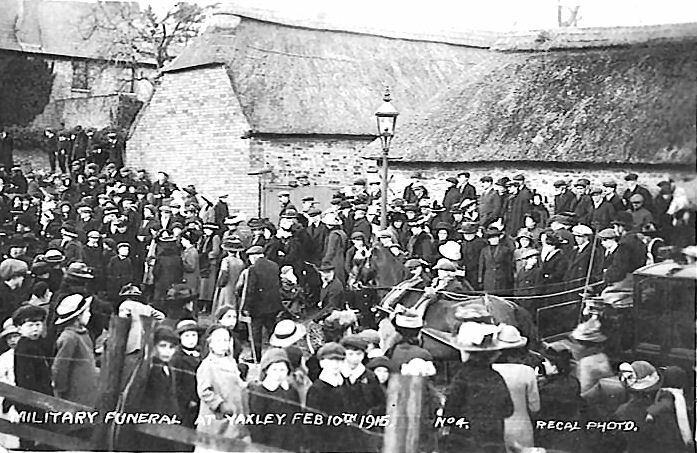 The memorial was unveiled by local clergy and dignitaries in 1920. It cost £185. AND FRO US MADE THE SUPREME SACRIFICE. A further memorial exists in the parish church consisting of an oak-wood tablet surmounted by a crucifix. This tablet was dedicated by the Bishop of Ely on 12th November 1922. There are 40 names for World War 1 and 20 names for World War 2. The details here are drawn from the cemetery memorial. There are discrepancies in the count of names on each memorial - see above. Lance Corporal 201916, 268th Railway Company, Royal Engineers. Died of wounds Tuesday 24th July 1917. Born Yaxley, enlisted Huntingdon, resident Peterborough. Buried in TROIS ARBRES CEMETERY, STEENWERCK, Nord, France. Grave I. T. 38. Lance Corporal 12725, 2nd Battalion, Northamptonshire Regiment. Killed in action Sunday 9th May 1915. Born Yaxley, enlisted St Pancras, Middlesex. Commemorated on PLOEGSTEERT MEMORIAL, Comines-Warneton, Hainaut, Belgium. Panel 7. Private 9892, 2nd Battalion, Bedfordshire Regiment. Killed in action Sunday 8th November 1914. Born and resident Yaxley, enlisted Bedford. Commemorated on PLOEGSTEERT MEMORIAL, Comines-Warneton, Hainaut, Belgium. Panel 4. Driver T4/045195, 371st Coy. 37th Reserve Park, Royal Army Service Corps. Died in England Sunday 28th February 1915. Age 47. Enlisted Peterborough, resident Yaxley. Son of George Brown, of Great Glemham, Saxmundham, Suffolk; husband of Laura Brown, of The Green, Yaxley, Peterborough. 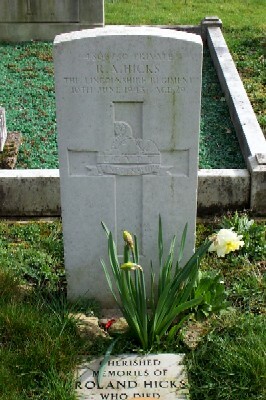 Buried in ALDERSHOT MILITARY CEMETERY, Hampshire. Grave AF. 1821. Gunner 77782, 25th Brigade, Royal Field Artillery. Killed in action Sunday 20th September 1914. Age 24. Born Peterborough, enlisted Newcastle-on-Tyne. Son of Mrs. M. E. Coles, of Broadway Terrace, Yaxley, Hunts. Commemorated on LA FERTE-SOUS-JOUARRE MEMORIAL, Seine-et-Marne, France. Private 57476, 1st Battalion, Royal Fusiliers (City of London Regiment). Died Wednesday 4th September 1918. Born Yaxley, enlisted Bedford, resident Peterborough. Buried in AUBIGNY COMMUNAL CEMETERY EXTENSION, Pas de Calais, France. Grave IV. E. 47. [Spelt GARRETT on CWGC & SDGW] Private 57143, 11th Battalion, Lancashire Fusiliers. Killed in action Tuseday 28th May 1918. Born and enlisted Scunthorpe, Lincolsnhire, resident Yaxley. Commemorated on SOISSONS MEMORIAL, Aisne, France. 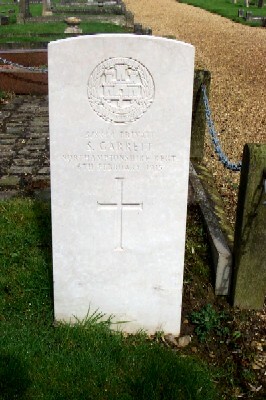 [Spelt GARRETT on CWGC & SDGW] Private 3/8844, 1st Battalion, Northamptonshire Regiment. Died of wounds 6th February 1915. Age 24. Born Yaxley, enlisted Northampton. Son of Mrs. Julia Garrett, of Main St., Yaxley. Buried in YAXLEY CEMETERY, Huntingdonshire. Grave 3. 105. Private 235238, 7th Battalion, Yorkshire Regiment. Killed in action Sunday 14th October 1917. Age 37. Born Bournemouth, enlisted Huntingdon, resdient Yaxley. 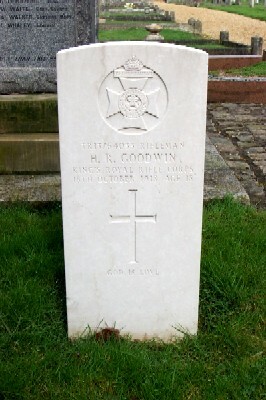 Son of Mr. and Mrs. W. Goodson, of Broadway, Farcet; husband of E. A. Goodson, of Derby Villa, Broadway, Yaxley, Peterborough. Commemorated on TYNE COT MEMORIAL, Zonnebeke, West-Vlaanderen, Belgium. Panel 52 to 54 and 162A. [Private on memorial] Rifleman TR13/64033, 53rd Battalion, Kings Royal Rifle Corps. Died at home Friday 18th October 1918. Age 18. Born and resident Yaxley, enlisted Cambridge. Son of Isaac and Ellen Goodwin, of Tiverton House, Broadway, Yaxley. Buried in YAXLEY CEMETERY, Huntingdonshire. Grave 3. 104. Private 225568, 1st (City of London) Battalion (Royal Fusiliers) London Regiment. Killed in action Thursday 18th April 1918. Age 27. Born and resident Yaxley, enlisted Huntingdon. Son of Samuel and Fanny Gorham, of Water End, Yaxley, Hunts. Formerly 602, Huntingdonshire Cyclist battalion posted to 2/4th Battalion, London Regiment. Buried in LONGUEAU BRITISH CEMETERY, Somme, France. Grave I. B. II. Private 140915, 21st Battalion, Machine Gun Corps (Infantry). Killed in action Tuesday 28th May 1918. Born and resident Yaxley, enlisted Huntingdon. Formerly 6529, Bedfordshire Regiment. Commemorated on SOISSONS MEMORIAL, Aisne, France. Private, 4th Battalion, Bedfordshire Regiment. Died of wounds Tuesday 24th April 1917. Age 23. Born Sawtry, enlisted Bedford, resident Yaxley. Son of Edward and Charlotte Housden, of Water End, Yaxley, Peterborough. Buried in AUBIGNY COMMUNAL CEMETERY EXTENSION, Pas de Calais, France. Grave II. B. 73. Private, 7th Battalion, Bedfordshire Regiment. Killed in action Tuesday 27th November 1917. Age 26. Born March, Cambridgeshire, enlisted Peterborough, resident Yaxley. Husband of Lucy Ethel Howard, of Middleton's Lane, Yaxley, Peterborough. Formerly 16364, Northamptonshire Regiment. Buried in ARTILLERY WOOD CEMETERY, Ieper, West-Vlaanderen, Belgium. Grave IX. B. 20. [List as Private on SDGW] Lance Corporal, 40455, 6th Battalion, Lincolnshire Regiment. Died of wounds Monday 3rd December 1917. Age 34. Born and resident Yaxley, enlisted Huntingdon. Husband of Mary Jackson, of Middleton's Lane, Yaxley, Peterborough. Formerly 19378, Bedfordshire Regiment. 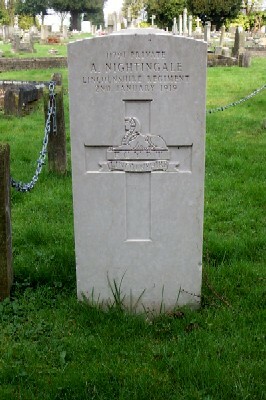 Buried in NOEUX-LES-MINES COMMUNAL CEMETERY EXTENSION, Pas de Calais, France. Grave IV. A. 15. Private, Lincolnshire Regiment - possibly ALFRED ROWELL, Private 14317, 1st Battalion, Lincolnshire. 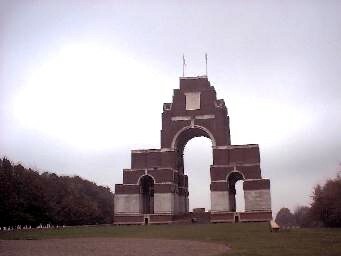 Died Monday 3rd July 1916. commemorated on THIEPVAL MEMORIAL, Somme, France. Pier and Face 1 C.
[List on memorial as Lance Corporal] Private G/50610, 2nd Battalion, Middlesex Regiment. Died of wounds Sunday 11th March 1917. Born and resident Yaxley, enlisted Bedford. Buried in GUARDS' CEMETERY, COMBLES, Somme, France. Grave II. B. 12. Private 3215, 6th Battalion, Bedfordshire Regiment. Killed in action Monday 23rd April 1917. Age 41. Born and resident Yaxley, enlisted Huntingdon. Son of John and S. A. Rusdale, of Faith View, Yaxley, Peterborough. Commemorated on ARRAS MEMORIAL, Pas de Calais, France. Bay 5. Private 26096, The Loyal North Lancashire Regiment. Died of wounds Friday 8th September 1916. Born and resident Yaxley, enlisted Huntingdon. Formerly 26117, Bedfordshire Regiment. Buried in HEILLY STATION CEMETERY, MERICOURT-L'ABBE, Somme, France. Grave IV. A. 68. Note: HMS "Pylades" was an Admiralty M Class, Destroyer part of 14TH DESTROYER FLOTILLA, GRAND FLEET in November 1918. Private 27704, 1st Battalion, Bedfordshire Regiment. Died Thursday 17th July 1919. Buried in YAXLEY CEMETERY, Huntingdonshire. Grave 3. 145. Private 43492, 1st Battalion, Essex Regiment. Killed in action Thursday 12th October 1916. Age 22. Born and resident Yaxley, enlisted Peterborough. Son of Charles Wallace Stanyon and Judith Stanyon, of The Green, Yaxley, Peterborough. Formerly 17050, Northamptonshire Regiment. Buried GREVILLERS BRITISH CEMETERY, Pas de Calais, France. Grave I. AA. &. [Listed as Signaller on memorial] Private 203503, 2nd Battalion, Bedfordshire Regiment. Killed in action Saturday 21st September 1918. Born Moreton Pinkney, Northants, enlisted Huntingdon, resident Yaxley. Commemorated on VIS-EN-ARTOIS MEMORIAL, Pas de Calais, France. Panel 4 and 5. Sergeant 295247, 2nd/4th (City of London) Battalion (Royal Fusiliers), London Regiment. Killed in action Thursday 20th September 1917. Born and resident Yaxley, enlisted Fletton. Son of Fanny Tomblin and the late William Tomblin; husband of Elizabeth Tomblin, of 15, Mitford St., Filey, Yorks. Formerly 228, Huntingdonshire Cyclist Battalion. Commemorated on YPRES (MENIN GATE) MEMORIAL, Ieper, West-Vlaanderen, Belgium. Panel 52. Sapper, Royal Engineers. - possibly G TOWNSEND, Corporal WR/287977, 272nd Light Railway Construction Company, Royal Engineers. Died Friday 17th January 1919. Buried in DEIR EL BELAH WAR CEMETERY, Israel. Grave C. 48. Private 24861, 3rd Company, 1st Battalion, Grenadier Guards. Died of wounds Wednesday 22nd May 1918. Age 25. Born Yaxley, enlisted Huntingdon. Son of Mr. and Mrs. C. Waite, of Cow Lane, Yaxley, Peterborough. Buried in ST. HILAIRE CEMETERY EXTENSION, FREVENT, Pas de Calais, France. Grave G. 15. [Listed as Lance Corporal on SDGW] Private 50707, Cheshire Regiment. Died of wounds Monday 22nd April 1918. Age 20. Born Yaxley, enlisted Huntingdon. Son of Elizabeth Parsons, of Middleton's St., Yaxley, Peterborough. Awarded the Military Medal (MM). Formerly 31937, Bedfordshire Regiment. Buried in HARINGHE (BANDAGHEM) MILITARY CEMETERY, Poperinge, West-Vlaanderen, Belgium. Grave V. B. 12. Private 18100, 1st Battalion, Lincolnshire Regiment. Killed in action Monday 3rd July 1916. Born and resident Yaxley, enlisted Boston, Lincolsnhire. Buried in GORDON DUMP CEMETERY, OVILLERS-LA BOISSELLE, Somme, France. Grave IV. P. 2. Lance Corporal, Royal Marine Commando. Sergeant 511912, Pilot, 114 Squadron, Royal Air Force. Died Saturday 15th February 1941. Age 29. Son of Joseph and Mary Ellen Barnes; husband of Gladys Grace Barnes, of Yaxley, Huntingdonshire. Buried in FLUSHING (VLISSINGEN) NORTHERN CEMETERY, Zeeland, Netherlands. Row A. Grave 6. Private 5835451, 4th Battalion, Suffolk Regiment. Died Sunday 13th June 1943. Age 33. Son of John William and Louise Beeby, of Yaxley, Huntingdonshire. Prisoner of war. 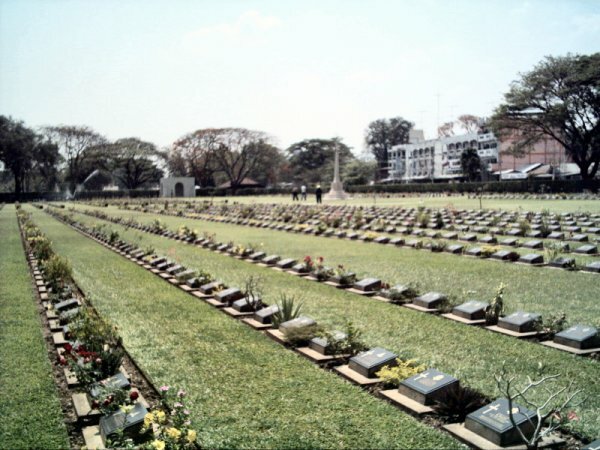 Buried in THANBYUZAYAT WAR CEMETERY, Myanmar. Grave B4. O. 6. Corporal, Royal Army Service Corps possibly THOMAS WILLIAM BINNS, Private 5881824, 5th Battalion, Northamptonshire Regiment. Died Friday 13th June 1941. Age 26. 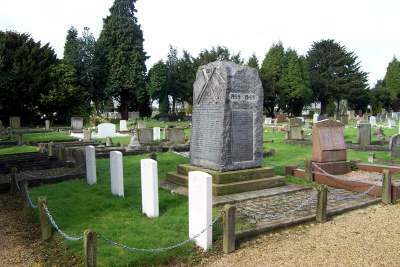 Buried in EASTFIELD, PETERBOROUGH, CEMETERY, Northamptonshire. Div. 4. Block 16. Cons. Grave 6361. Private 5777219, 5th Battalion, Royal Norfolk Regiment. Died Sunday 15th February 1942. Age 25. 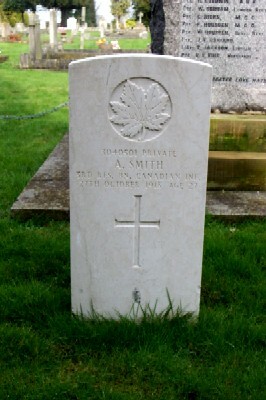 Died in the final days fighting in Singapore before the surrender. 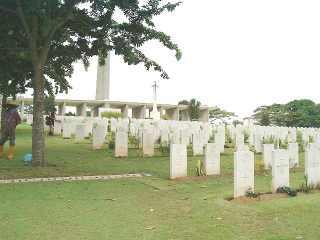 Buried in KRANJI WAR CEMETERY, Singapore. Collective grave 17. D. 4-11. Private 5832948, 2nd Battalion, Cambridgeshire Regiment. Killed in action at Segarrang Saturday 24th January 1942. Age 26. Son of Arthur and Martha Lily Chambers, of Peterborough, Northamptonshire. Commemorated on SINGAPORE MEMORIAL, Singapore. Column 58. STM, R W A A F? Sergeasnt 363370, Pilot, Royal Air Force. Died Tuesday 24th September 1940. Age 33. Son of William James Clements and Ada Florence Clements; husband of Gladys Rose Clements, of Rustington, Sussex. Buried in YAXLEY CEMETERY, Huntingdonshire. Sec. 3. Grave 877. Flying Officer 55632, Pilot, Royal Air Force. Died Saturday 28 October 1944 . Age 28. Son of David and Louisa Jane Foreman, of Stroxton, Lincolnshire. Buried in NASSAU WAR CEMETERY, Bahamas. Grave West. C. 2. Private 4806730, 2nd Battalion, The Lincolshire Regiment. Died Thursday 10th June 1943. Age 29. Son of Alfred and Flossie Hicks; husband of Elvira May Hicks, of Yaxley. Buried in YAXLEY CEMETERY, Huntingdonshire. Sec. 3. Grave 848. Private 5830955, 4th Battalion, Suffolk Regiment. Died Wednesday 8th September 1943. Age 25. Prisoner of war. Buried in KANCHANABURI WAR CEMETERY, Thailand. Grave 2. N. 59. Corporal 5889496, 5th Battalion, Northamptonshire Regiment. Died Thursday 29th March 1945. Age 29. Son of William and Annie Hussey, of Yaxley, Huntingdonshire; husband of Dorothy May Hussey, of Yaxley. Buried in ROME WAR CEMETERY, Italy. Grave I. D. 24. Private 5884626, 5th Battalion, Northamptonshire Regiment. Died Tuesday 1st December 1942. Age 22. Buried in MEDJEZ-EL-BAB WAR CEMETERY, Tunisia. Grave 1. A. 15. [Listed as Private on memorial] Rifleman 14631333, 1st Battalion, Kings Royal Rifle Corps. Died Friday 27th October 1944. Age 20. Son of Arthur and Eva Marion Merchant; nephew of Mr. and Mrs. E. H. Burks, of Yaxley, Huntingdonshire. Buried in CESENA WAR CEMETERY, Italy. Grave II. B. 2. Private, 14705766, Royal Army Medical Corps. Died Saturday 21st October 1944. Age 21. 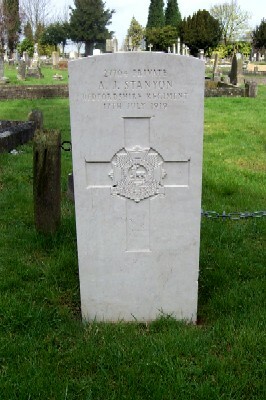 Son of Herbert and Emily Thompson, of Yaxley, Huntingdonshire. Buried in OVERLOON WAR CEMETERY, Noord-Brabant, Netherlands. Grave II. A. 9. Lance Corporal, Royal Engineers - possibly HOWARD ERNEST WEBSTER, Sapper 2193042, attached, Royal Army Service Corps. Died on Sunday 29th November 1942. Age 23. 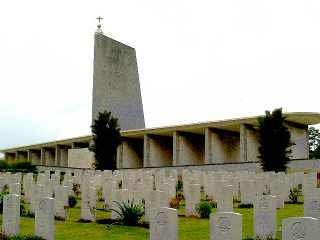 Buried in BONE WAR CEMETERY, ANNABA, Algeria. Grave III. F. 15. Private 5830147, 5th Battalion, Green Howards (Yorkshire Regiment). Died Sunday 26th May 1940. Age 21. Son of Clara Whaley, of Yaxley, Huntingdonshire. Buried in BUS HOUSE CEMETERY, Ieper, West-Vlaanderen, Belgium. Grave AA. 14. Sergeant 920681, 135 (The Hertfordshire Yeomanry) Field Regiment, Royal Artillery. Died Monday 26th January 1942. Age 21. Son of H. J. and Alice Elizabeth Whitehead, of Yaxley, Huntingdonshire. Commemorated on SINGAPORE MEMORIAL, Singapore. Column 35. Flight Lieutenant, Royal Air Force. 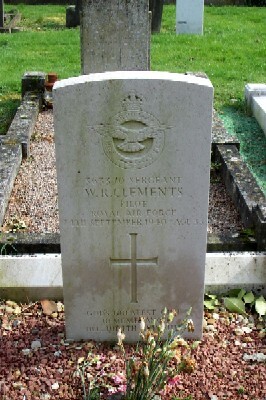 Crashed in his Lancaster Bomber 4th March 1943. Corporal, Special Air Service, ex Royal Marines. Killed when a Puma helicopter crashed near Baghdad, in Iraq, on Tuesday 20th November 2007. Aged 26. Another soldier killed in the same accident was Sergeant John Battersby also of the SAS, 12 others were injured. Their identities were kept secret until a court order was lifted on 29th July 2008. Cpl Fitzsimmons joined the Royal Marines in 1999 aged 17. He saw active service in both Iraq and Afghanistan. Private, Royal Army Medical Corps. Died at Blomfentein 28 March 1900.